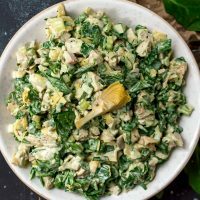 If you are a fan of the spinach and artichoke combo, you are going to LOVE this Spinach Artichoke Chicken Salad! 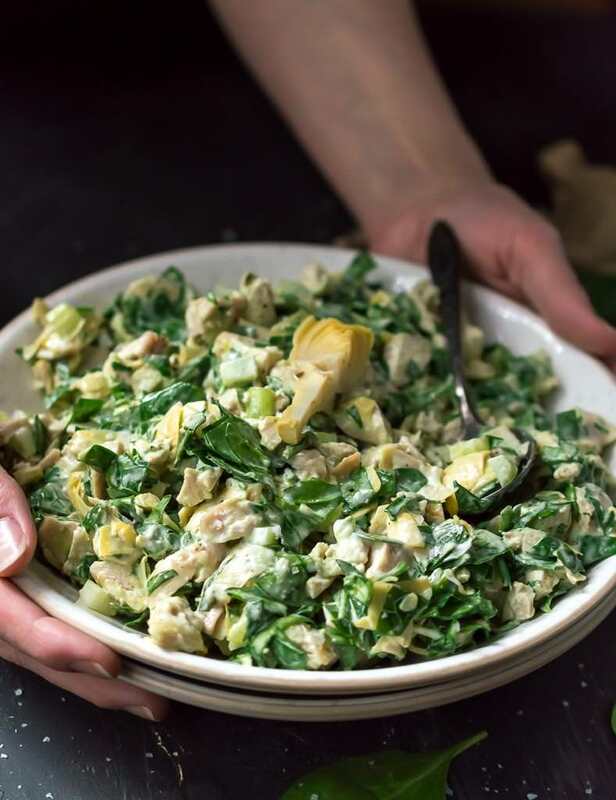 This basic chicken salad recipe is made unique and extra nutritious with the addition of fresh spinach and artichoke hearts! 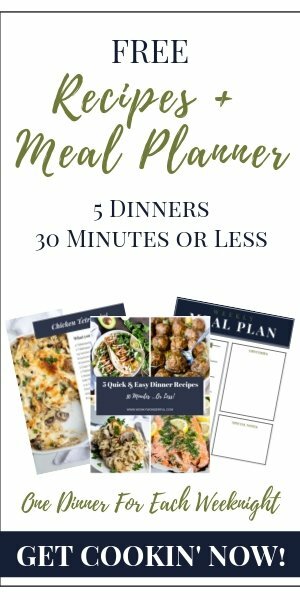 Great for lunch, dinner or meal prep. This recipe is Paleo compliant, Whole30, dairy free, gluten free and grain free. 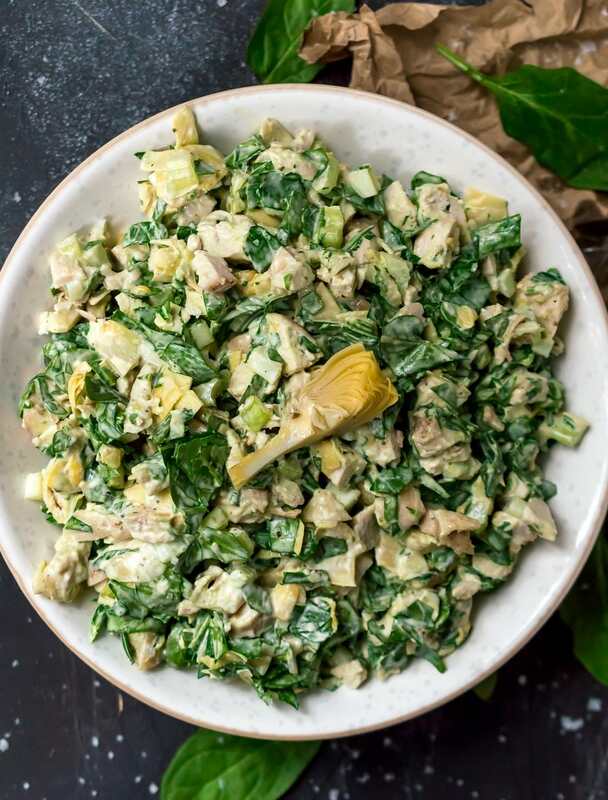 You all must have a thing for unique chicken salads too because these are some of my most popular recipes. I’m guessing because chicken salad is so great for meal prep and lunches on-the-go. Or, if you’re here because you love the spinach and artichoke combo. . .
How should you cook the chicken? Check out this tutorial for OVEN BAKED CHICKEN BREAST, my preferred method. You can cook the chicken however you prefer: grilled, pan fried or even use a rotisserie chicken. 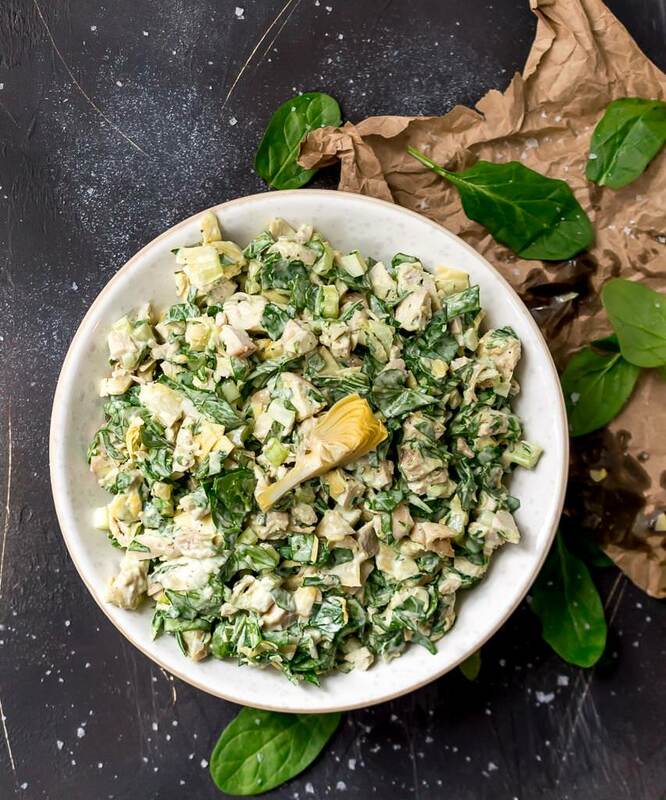 How should you serve this Spinach Artichoke Chicken Salad? If limiting carbs (like me) serve this chicken salad over a bed of lettuce or arugula. Or make into chicken salad lettuce wraps. If carbs aren’t an issue, this chicken salad is great in tortilla wraps, sandwiches or over rice. You’ll need a good Baking Dish and Meat Thermometer . For meal prep, I use these Glass Meal Prep Containers with Lids . Quality, sharp knives are always good to have in your kitchen. I use these Chef’s Foundry Ceramic Knives and LOVE them! Feeling lazy? No judgement here…we all have those extra busy days. Use a store bought rotisserie chicken instead! Don’t have a jar of marinated artichoke hearts? You can use canned artichoke hearts or frozen (thaw them first). If following the Whole30 diet it will be difficult to find marinated artichoke hearts that are compliant, so the canned or frozen are a better fit for W30. Want more flavor? Here are a few add-in ideas: finely chopped red onion, dried Italian seasoning, shredded mozzarella (for non Paleo, W30 diets) or roasted garlic. Hmmm. The recipe for lemon chicken artichokes looks great but how many artichokes? I”m guessing one 14oz. can? Yes, 1 cup chopped is almost an entire 14 oz jar.